This entry was posted on October 14, 2014 by Jessica Anderson. 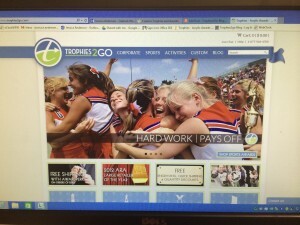 Introducing Our New and Improved Trophies2Go Website! The BIG DAY has finally arrived...our website has launched! After a year of planning, meeting, taking pictures, writing code, editing products, importing orders, it all culminates to LAUNCH! To say we are excited is an understatement! Moving the Trophies2Go website to a new ecommerce platform is one of the biggest undertakings our company has completed. And finally, we can share it with you, our customers! Our hope is that this new website offers a faster, easier, and positive shopping experience. What Does Our New Site Offer? Better Pictures. Check out our beautiful, high resolution product photos with the ability to hover over the picture to see greater detail. Quick Ship Items. Need something fast? We have lots of options with only one day production time! Custom Products. For the first time, we are offering custom products on our website. From medals to acrylic awards featuring your logo, we will be able to make a unique award just for you. Check out all of the new products here. Real Time Inventory. Put an award in your cart and you can see exactly when it will be shipped to you. If we have it in stock, we will get it out the door! Live Chat. Live chat is another way to get the great customer service you expect from Trophies2Go. Speak with one of our friendly customer service team anytime – via phone, email or live chat. They are here to help! Check out our new site now and see the improvements for yourself! I invite you to visit, poke around, and check out our free shipping, expedited production times, and other benefits. If you have any comments about the new site, Jeff and I would love to hear them. Feel free to email me at [email protected] or comment below. Thank you for being a valued customer and we look forward to serving you soon!